The festival has been crafted by Executive Chef Rishi Manucha. An expert on Pan-Asian food himself, Chef Rishi has also roped in Ms. Mi Kyeong Choi, who runs a number of Korean restaurants and guest houses all over India. The menu has been curated by Mrs Sang Hee McAllister, the Korean wife of the British Deputy High Commissioner in Hyderabad, and a food enthusiast. Some of the recipes here have come from her own kitchen, perfected over generations. Invited to a preview of the festival, my attention was immediately drawn to the nicely laid out salad counter at one corner of the restaurant. 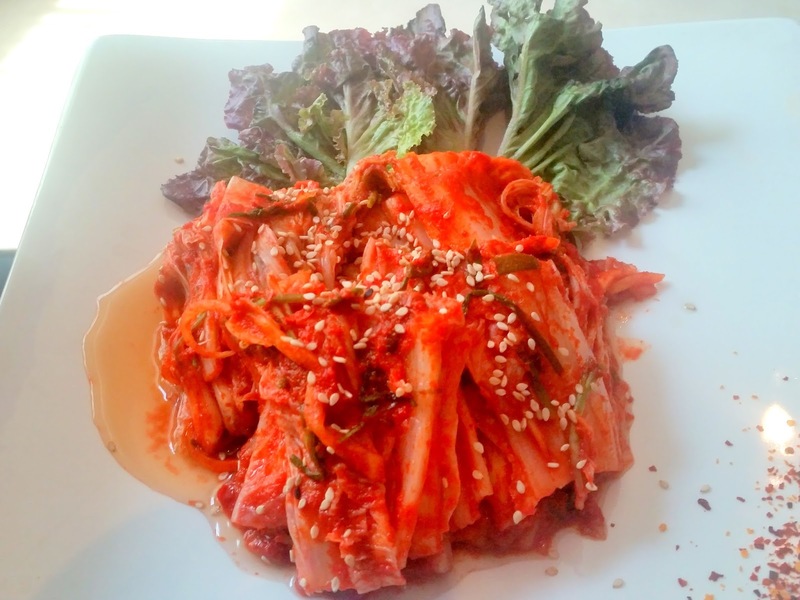 The counter had at least five versions of Kimchi, which is possibly the most known item of the Korean cuisine. For the uninitiated, Kimchi is a usually spicy side dish which is very prominent in Korean cuisine, made of vegetables (often the leafy variety and fermented) and different sauces. 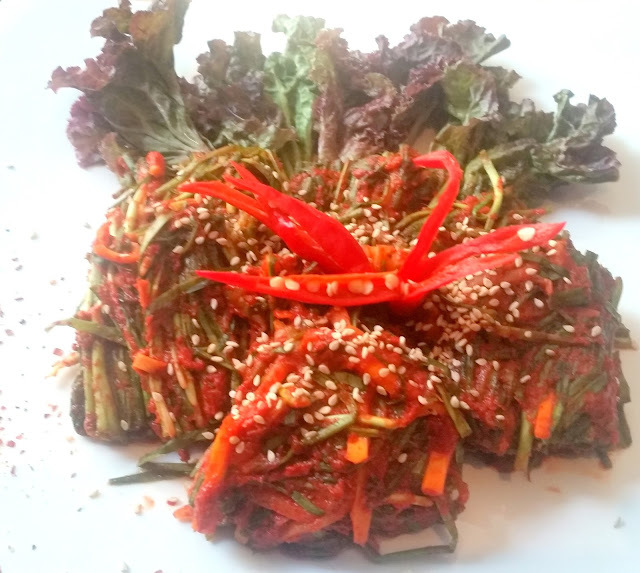 So far, I had only tasted kimchi with cabbage and Gochujang, the signature fermented red chilli paste. But here each of the kimchis used different vegetables and sauces which made them so special. 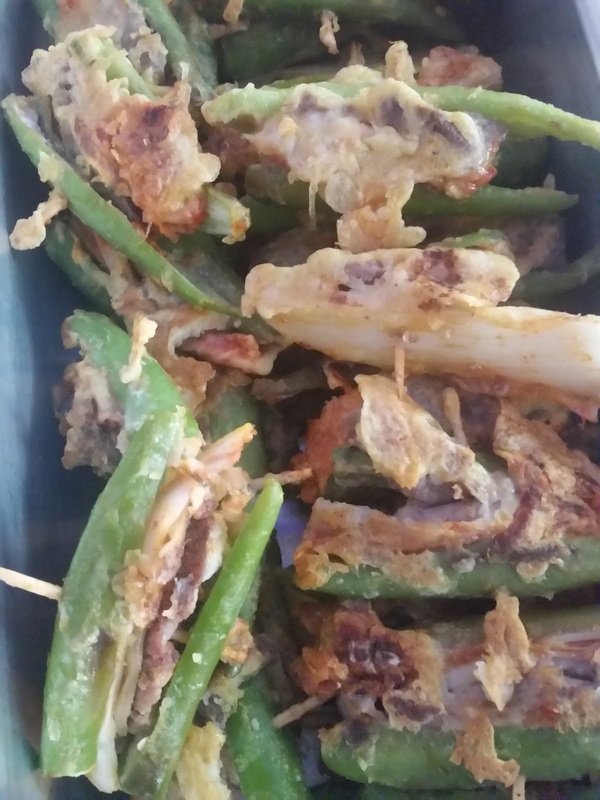 The vegetables that went into these included diced radish, spinach and even fermented seafood. A simple one I specifically liked was MulKimchi a soupy version with cabbages, chillies and carrot. 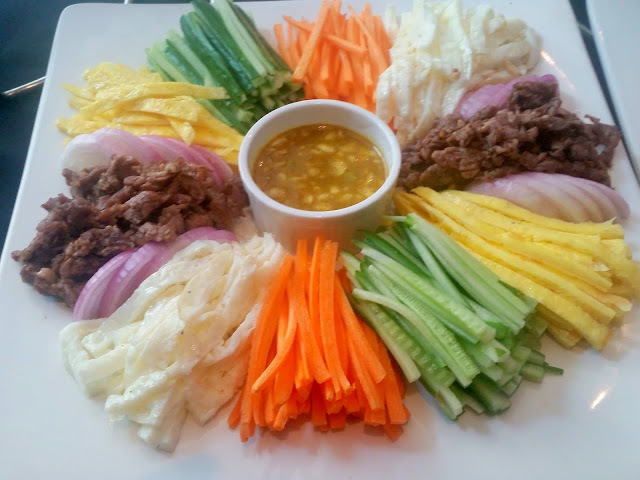 A salad which everyone went for consisted of colourful strips of an assortment of fresh veggies, egg and beef. It was served with a prominently mustard based dip which was a complete delight. The dip had wasabi, chopped garlic and honey among other ingredients and the resultant zing it had was the perfect foil to the veggies and meat. The dip was so good that we even used it later along with our main courses. To go along with the food, I was served a white wine based Sangria, whereas some others preferred the red wine version. But as the meal progressed I found out that pairing the dishes with some Korean style Cinnamon Tea works out much better. Over the lunch Mrs. McAllister explained in detail about the cuisine and patiently answered all of our queries. 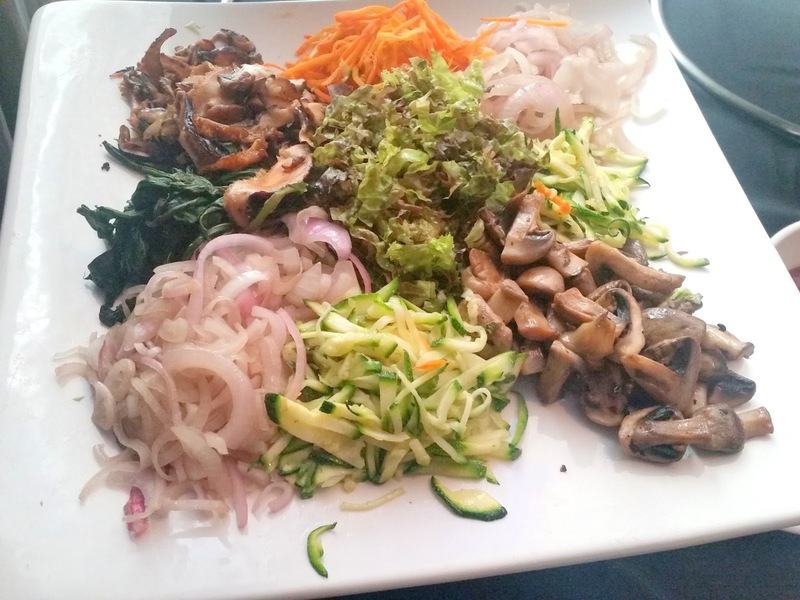 She explained that the Korean cuisine is extremely simple and flavorful. 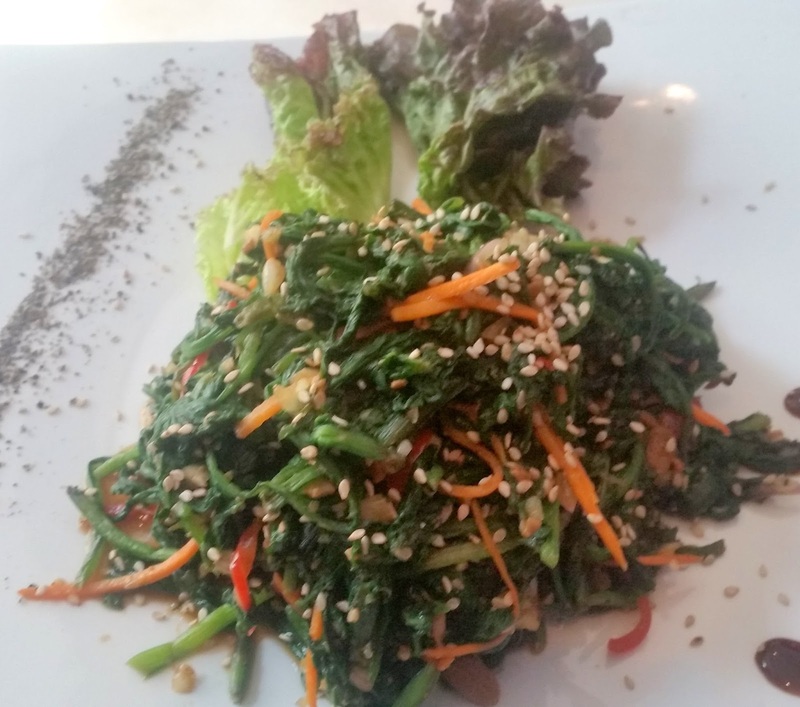 The Koreans eat a lot of vegetables – both fresh and fermented. 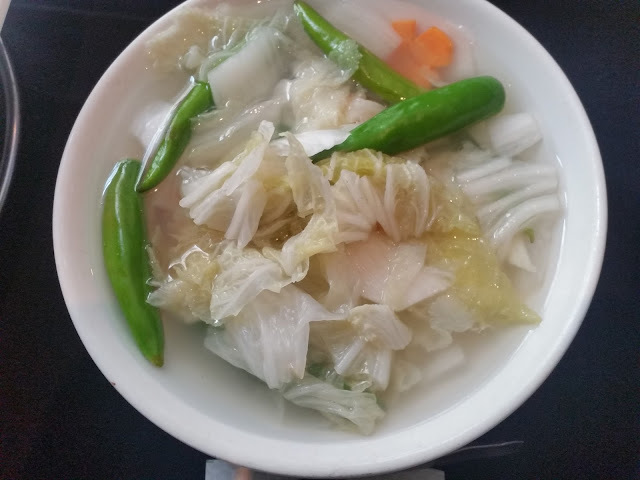 Cabbage, yellow beans and radish are some of the popular vegetables in Korea. Among meat Pork is the most popular (though this festival does not showcase pork dishes) followed by beef. Korea is surrounded by sea on three sides, and the long coastline ensures that a lot of seafood goes into their menu, especially prawns, fish and squids. The spices used are mainly sesame seeds, soya, bean paste, garlic, ginger and red chillies. The salad counter would have been good enough for me to have a complete meal, but there were also a vast array of starters and main courses lined up on the other side. Bulgogi, or grilled meat is another highlight of Korean cuisine. 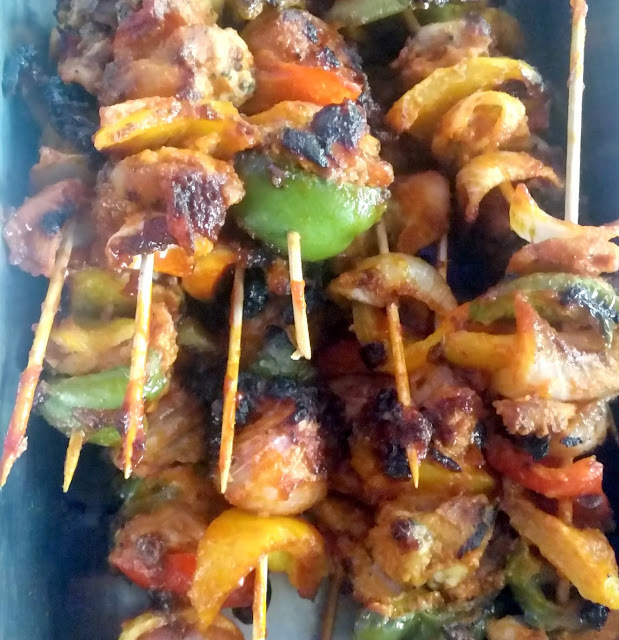 There was Dakgochi Bulgogi – sweet and sour marinated chicken and vegetable on a stick which was particularly liked by me. BBQ Beef Roll had an outer layer of beef and marinated vegetables inside, and the combination worked well with me too. 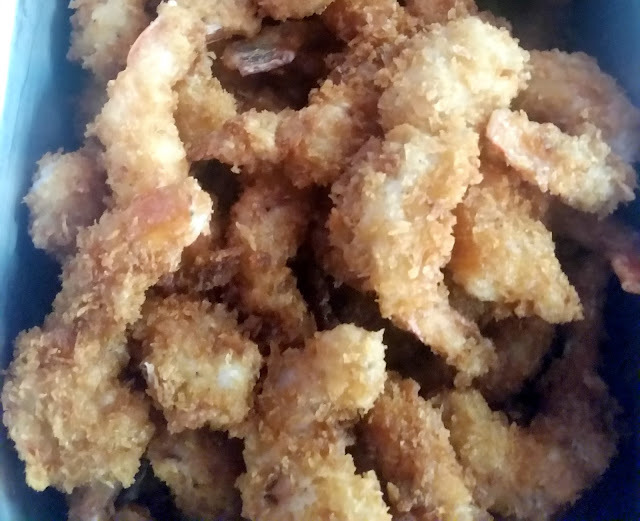 Saewootwikim was essentially shrimp tempura for which I went back to the salad counter and used some brilliant red chilli based dip to go along. The Chicken Kass or pan fried breasts of chicken in a light batter was another starter which was in demand. A fish version of the same item was available too. Dogani Tang or the mutton soup served had boiled mutton and was very bland for my palate. Among the vegetarian items, a Cabbage and Lentil Pancake tasted just perfect. There was fried Kimchi too which was nothing extraordinary. 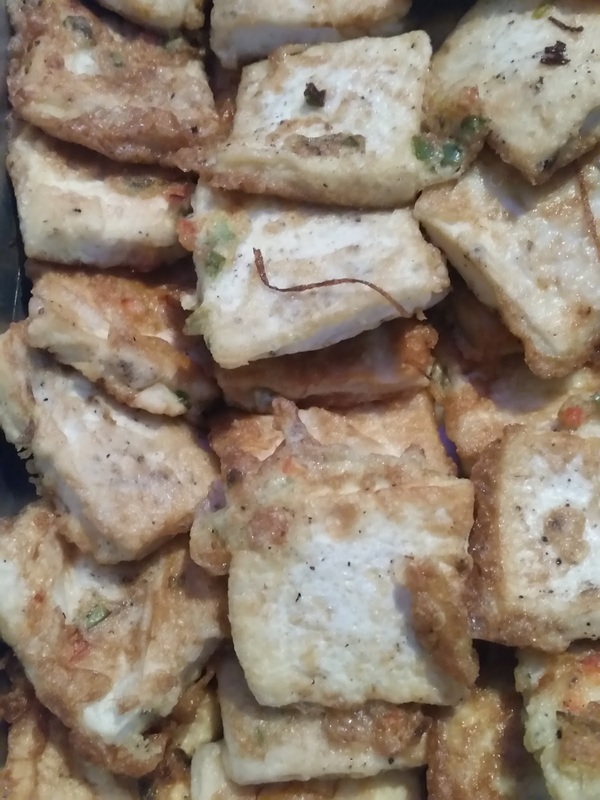 Jabche, an unique noodles dish prepared from sweet potatoes in a soya based sauce and went well with Tofu Jeon or tofu fried in a batter. For desserts Koreans mostly prefer cut fruits. We had a platter of fresh fruits served to us. The restaurant also served us some desserts from their own menu, including a cheesecake and mud pie cake. Overall, it was a very interesting experience. 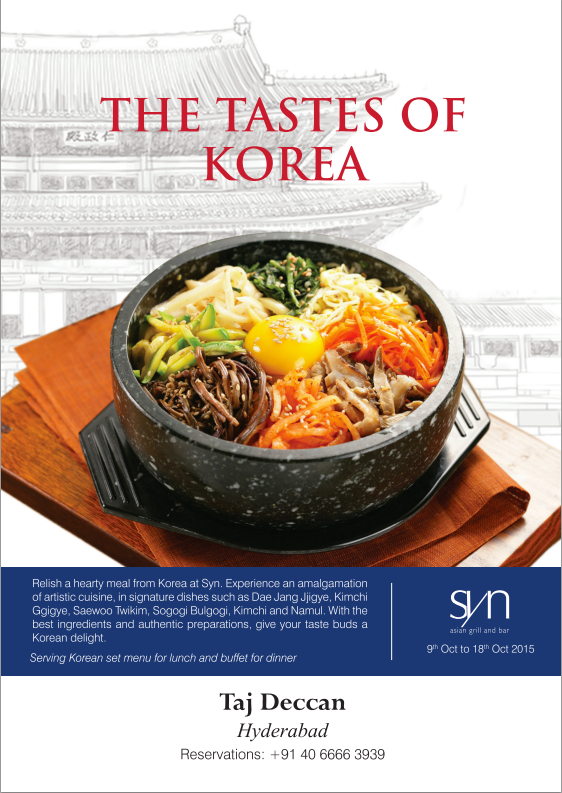 Korean food is quite different from the standard Pan-Asian stuff we are familiar with. The food has subtle flavours and uses a lot of fermented ingredients, and some of the sauces and dips are fiery. Chef Rishi has researched a lot to ensure that the best dishes of the cuisine has been showcased at the festival. 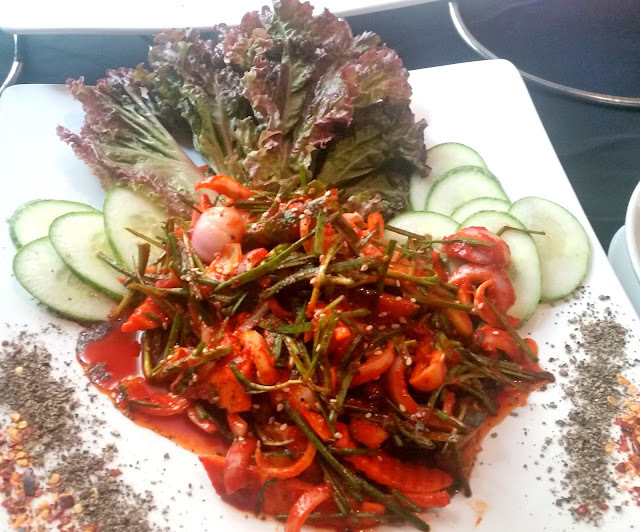 He shared with me that Koreans like Hyderabadis are in love with their chillies. 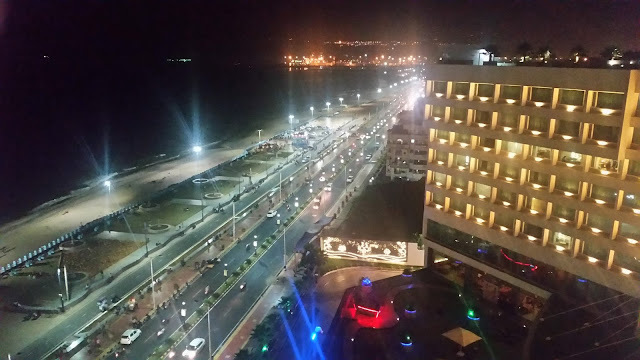 The festival is on till 19th October. There is a set menu for lunch (Rs. 1099) and a buffet dinner (Rs. 1399). Food lovers with penchant and openness for trying out new styles and lovers of oriental cuisine will find this festival to be a good option. Some of the fiery dips which accompany the food may also please the Hyderabadi palate. A food festival is a great way to introduce a new cuisine to a city.